So I’m gone almost 6 full days this week. A new record for me! In an attempt to keep my guys from having to go out to eat every night while I’m gone, I’ve put together some meal options for them. I’m leaving spaghetti for them to have tonight. And here’s what I’ve left for the rest of the week. 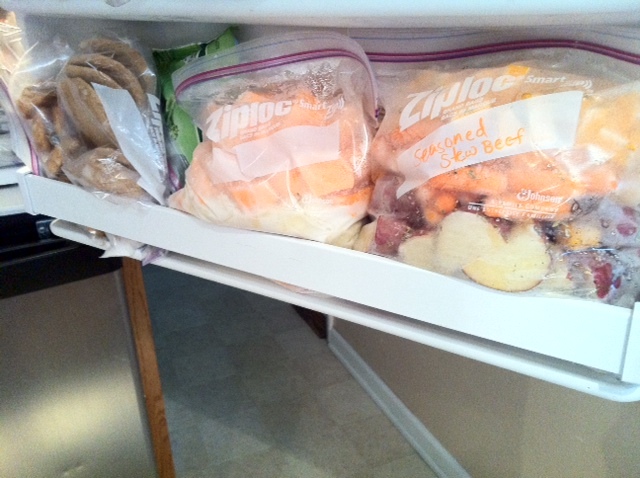 (I even organized it neatly into the freezer door to make things even easier for our sitter and for my husband, as he plays Mr. Mom while I’m gone. So now my husband’s job as Mr. Mom will hopefully be a little easier while I’m away! Place the pork roast in the base of a slow cooker. In a small bowl, mix together the cranberry sauce, juice and zest from the orange, cinnamon, nutmeg and cloves. Pour over the roast in the slow cooker. Prepare broccoli or other vegetables. Serve Orange-Cranberry Pork Roast with broccoli and rice. Very nice! SO cool that you do all that preparation! That’s my ham glaze! I never thought to use it for a pork roast. Great idea! I seriously wish you would come visit my freezer. You could be my freezer fairy! This sounds good. How long does it need to be in the crockpot? Should I could it on low or high? I have some apple-jalapeno jam someone brought as a gift but I have no idea how to use it; do you think I could substitute the cranberry sauce for it? Also, what spices could I add to it? Thanks, you are a great inspiration and help in my household of 7. I appreciate all the effort you take to figure out meals that help me. I have not tried this recipe yet, but I am going to make it tonight! I cannot believe that it only costs $6.13! I would never know it by looking at it! I need inexpensive great recipes. I will be coming back to look for some more recipes. Possibly, I can save money and have great meals to – is that possible really? ?